Dictionary is an essential application that we use regularly in our daily life. 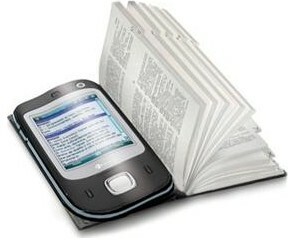 With the advancement in software technologies, dictionary applications are now available for computers and mobile phones. Native and Non-native learners can browse through English words, definitions, synonyms, etc. using standalone dictionary software. These days more and more smartphones are being released in the market. People now spend a lot of time on mobile phones. Having a mobile dictionary in our device would help us to get English-related queries answered on the go. Typical freeware dictionary software are either ad supported or with limited functionality. Low and high budget Nokia, Karbon, Sony Ericsson, LG, Micromax, Samsung, Spice, HTC (Windows Mobile) phones supports Java applications. 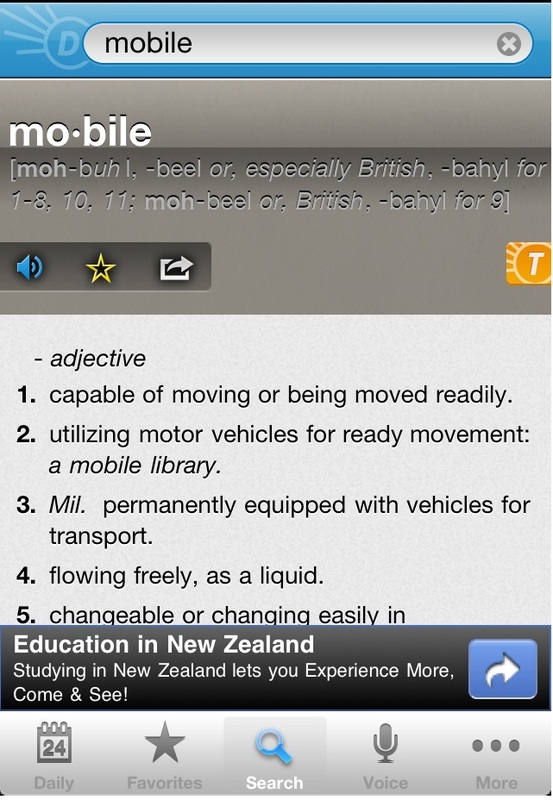 Dictionary v3.1 is simple Java based mobile dictionary software. The interface of the application is not that impressive. But it is more than enough for a normal user. This application includes the definitions for around 30000 English words and it can work without an internet connection. Download Dictionary v3.1 here. Extract the ZIP file and transfer the .JAR (Java Mobile application) to your phone and install. 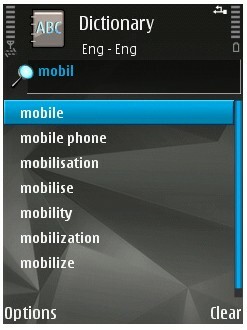 Nokia has a special dictionary application that is developed for their Symbian handsets. The application is very simple to use and it support multiple languages. The basic English-to-English dictionary is 1.5 M in size. It will be pre-installed on all compatible Nokia handsets. Further you can download different language packs to extend the functionality of the dictionary. Finnish, Hindi, French, Greek, Hungarian, Icelandic, Indonesian, Italian, Arabian, Bulgarian, Chinese,Czech, Danish, Dutch, Japanese, Korean, Portuguese, Romanian, Spanish, Russian, Urdu language packs add corresponding word support for the dictionary. We can’t provide a link to the English version as the software is copyrighted. Just search in Google for “Nokia Mobile dictionary unsigned” version and download it. Once you’ve the English version you can add additional language support to it, by visiting the official Nokia web page here. Check this page to know how you can sign the original English dictionary installer for your device. 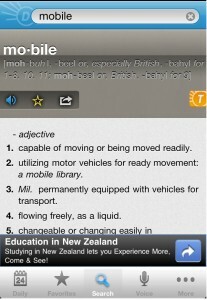 Dictionary.com offers an excellent mobile dictionary application for Apple devices like iPhone, iPod Touch and iPad. You can download it free from the iPhone app store here. This application comes with a database of around 320,000 words and definitions. Moreover, there is another section that shows the synonyms, antonyms, phonetic and audio pronunciations, spelling suggestions, of the word searched. Android and BlackBerry versions of Dictionary.com app are also available, but you need a reliable data connection connection to use them. May the TRUE JESUS OF THE BIBLE will come to save you. Amen. finding no mobile free dictionary yyyyy? gud directory which i realyhttp://us.i1.yimg.com/us.yimg.com/i/mesg/emoticons7/100.gif approciate. how to install this to mobile.. thanks in advance. experiense is the base of our life. How can download this. I have samsung e1410 mobile set. I have Nokia 3500 classic.Where is download option ? i want to download this dict. HOW CAN I DOWNLOAD IT IN MY SAMSUNG E 1410? How can download this dictionary to my phone. where is d downloading option…??? how can download in this software my mobile. whr is da dwnload link yaar????????? how to download china mobiles. i need to download an english to english dictionary. i love nepal.i need to download an english to english dictionary. How can I Free download the Oxford Dictionary for nokia 7610? I think, this is not a good job to remain people busy in searching free dic for mobile if u r not willing give it free. Otherwise, pls, make it easy and give the download option. Thank u.
wher is the download option………………..
i want to down load this dictionary for samsung b3410 but there is no any option for down load. please tell me about this i would be thank full to you. Anyone.Plz tell how to download this softwear in my phone.Plz give me this link. please let me know how to download it…….. Please send me the link, don’t know how to download it. i want to download such a free mobile english dictonary with english words used sentences in it. i have FLY handset mobile . shall i able to download ? The softwares of free mobile dictionary have not left any option for downloading. What type of offer is it? Hello for those who are responsible for of this website…..
You know almost 99% submit theis comments about that “how to download this product”. But you are still silent and have not took anz step.This is not fair…. Kindly give suitable link for downloading…. Hi friends.I downloaded dictionary v3.1 its very good.It works.Download it then unzip it.After unzipping you get a Jar.file of dictionary.copy this to your cell phone.Click on the folder of this jar.file in your cell phone.It will give you the option of install.press install.then if your cell have enough memory available it will give you the message that launch dictionary press Launch then it will start.Click start and use dictionary.If your cell phone doesn’t have enough memory then it will give you the message that dictionary requires more free space then you should delete some files from your cell phone like unwanted video and other music files that cover large space and then try again.I had never been successful in downloading any mobile dictionary that works so this is my first time thats why i am suggesting you all.Thanks to the relevant web host.I am really grateful to you. wonderful. this is easy to use. Thank you for your usefull services. I’m a young man, seeking about gf, anyone can help me, please? i want hindi to english dictionary for my Samsung corby pro phone. Please tell where will i get it. ?